Every now again, I have a bad day, don’t we all? But sometimes, I’m cranky and irritable for no good reason. I know this might sound odd, but one thing I’ve learned since venturing into a macrobiotic inspired lifestyle is that baked flour makes you cranky and irritable. The baking process dries out the flour which in turn has a drying effect on your body, causing tightness and stiffness in your joints and muscles and irritating your liver (which apparently causes you to get cranky). Ever since I’ve changed my eating habits, it has gotten much easier to notice the effects of certain foods on my mood and body and identify the culprits. When I eat too much bread (even good quality whole grain sourdough bread) or other baked flour goods, I thoroughly enjoy those moments of gluttony, but then I start to get irritable and my psoriatic arthritis tends to act up (albeit much more mild than it once was), and that’s when I know I need to cut back on the baked goods. After last weekends Sachertorte Cupcake overdose (I won’t tell you how many I ate), I decided it was time to take a break from baked flour goods, for a few days at least. So, I set myself a no-bake challenge (which to be completely transparent does not mean I don’t eat anything baked, it means cutting back as much as possible) to find new ways to satisfy cravings for baked goods without flour and/or lbaking. One thing I’ve started doing when I’m craving bread lately is steaming it instead of toasting it. Yes, steaming it, you read that correctly. Although it’s initially baked, steaming the bread puts moisture back into it, making it easier on your body. It sounded really strange and gross to me at first (especially because I love crusty bread), but then I tried it and it was amazing. If you start with good quality Sourdough bread, it holds up really nicely and doesn’t fall apart and get floppy (as I imagine a piece of commercial white bread might). To steam the bread, just slice it to your desired thickness (not too thin). Place a pot of water and a steamer basket on medium heat and bring water to a boil. Put the bread in the steamer basket (make sure the water level is not touching the bread), cover and let steam for 2 minutes. Remove the bread from the steamer and on to a plate, spread it with your favourite topping and enjoy. In the picture above, I topped it with light organic tahini and apple juice sweetened apricot jam (this is not a paid product endorsement, just two of my favourite spreads for bread). But that’s technically cheating and doesn’t quite qualify for the No Bake Challenge, since the bread was baked to begin with. There is a macrobiotic recipe for steamed bread out there that involves fermenting brown rice with miso to make a riser and then cooking the bread in a steamer basket, but I haven’t attempted it yet. I promise to share the results once I do. 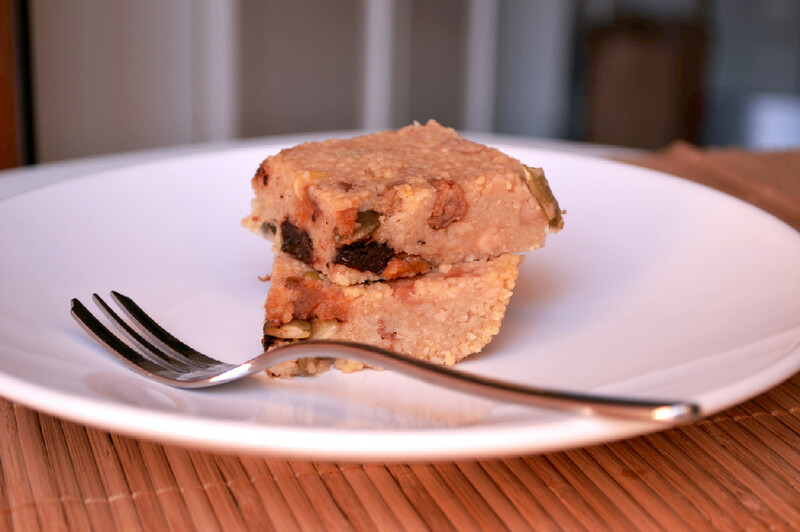 For now, I will share another treat that I love, Couscous Squares, made from whole wheat couscous, a mixture of dried fruits for sweetness, pumpkin seeds for added crunch, apple juice and water. Simple as that. They are perfect for breakfast or as a snack throughout the day. They are light and tasty and cake like without the flour and baking. I put them together on Monday evening and enjoyed them over the next few days, as a snack on the go, in between meals and lessons. 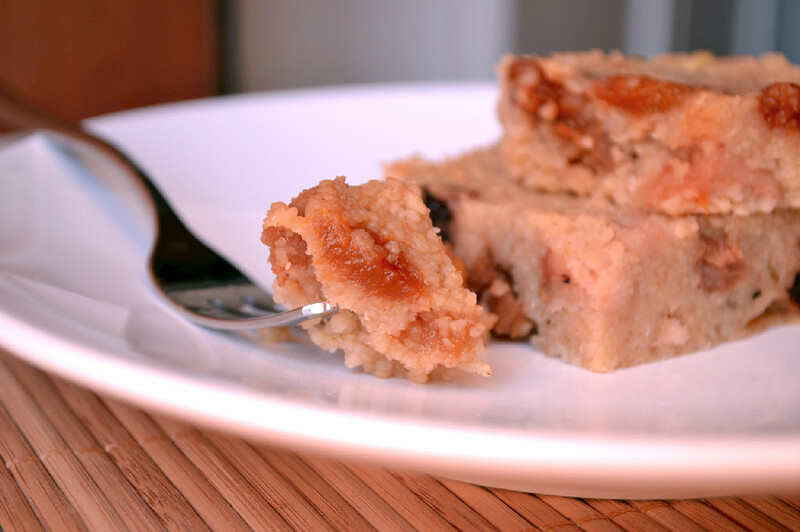 These squares are sweetened with unsweetened apple juice and dried fruit and aren’t super sweet. While I didn’t add any additional sweeteners here, you can if you want them on the sweeter side. On a side note, apple juice is not only great as a sweetener, but it also has an alkalizing effect on the body, balancing your PH levels and helping you to rid toxins from the liver (a perfect remedy for too much baked flour). We’ve all heard “an apple a day keeps the doctor away” and that’s even more true of apple juice. Bring apple juice, water, dried fruits and pumpkin seeds to a boil in a large pot. If you want, at this point you can also add vanilla, cinnamon, maple syrup or other flavouring of choice. Pour in couscous in a waterfall manner, while stirring. Remove from heat, cover and let sit for about 10 minutes so that the couscous can absorb all the liquid. Stir in nuts if using. Press mixture into a baking dish, to about 1 inch thickness, using the back of a silicone spatula or your fingers if you can handle the heat (I can’t) and let “solidify”. Slice up into squares and enjoy for breakfast or a light snack throughout the day. Hi Nissrine, another super simple, super delicious sounding recipe. Cant wait to try this one too!